In response to security uncertainties and to increase the defense capabilities of the United States, the U.S government chose Hanford, Washington as the home to the first full scale plutonium production facility as part of the Manhattan Project. Due to the size of the facility more than 1,500 people were told to evacuate their homes and infrastructure including 554 new buildings replaced them. The production of plutonium and eventual modification in to a waste storage facility continued until the late 1980s. In 1988 the facility was put on the National Priorities List for the Superfund Clean Up. What was most concerning was the proximity of the contamination to the Columbia River that is the water source for millions of people. Clean-up continues even today with the threat of ground water contamination still looming. Another aspect of this EJ conflict, is that there were a number of Native American tribes living on this land and had rights granted through treaties to use the resources in this area that are now terribly polluted. Their natural rights were removed and took away part of their abilities to follow traditional ways of living. The intensity of the mobilization increased in the late 1980s as organizations began to push for cleanup due to the heighten threat of ground water contamination leading to contamination of the Colorado River. There has been steady mobilization by organizations and the government to clean-up the large area completely. The site has been in remediation since 1989 and continues to be cleaned up. However, due to the size and extensive contamination it is expected that the clean up will not be complete soon. 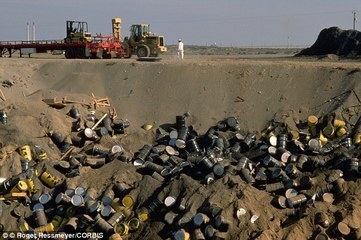 Annually, around 2 billion dollars is spent on the remediation. Project Details The US Department Of Energy estimated that radioactive and chemical contamination included: 2,300 tons of spent nuclear fuel, stored in two aging basins just 400 yards from the Columbia River, 12 tons of plutonium in various forms, 25 million cubic feet of buried or stored solid waste, much of it in unlined trenches, 1400 waste sites (more were discovered later), 500 contaminated facilities, 200-square miles of contaminated groundwater, with 80-square miles exceeding the EPA's "acceptable risk" for drinking water standards, and 53 million gallons of high-level nuclear waste in 177 aging underground storage tanks. Pathways for conflict outcome / response The project and location is still in operation. 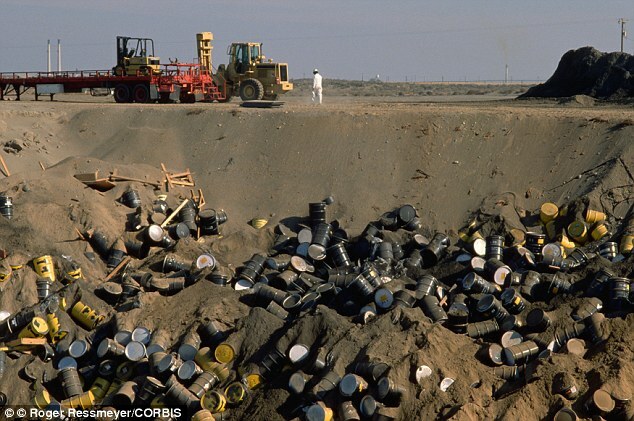 The plutonium waste storage facility recently found a leak that has begun contaminating a small area of land. Remediation plans are being formed by the US Department of Energy. Why? Explain briefly. Not Sure, the potential for contamination as well as the degradation of areas that were promised through treaties to the Native American population was allowed to happen for decades by the U.S government. The contamination is rampant and the land will most likely never be able to serve the same purpose as it did prior to the facility in 1944. While it is good that the mobilization allowed for the clean up process there are several issues that will never be resolved.